Arrestins were first discovered as negative regulators of G protein-mediated signaling by GPCRs: they bind GRK-phosphorylated active receptors and preclude their further coupling to cognate G proteins. Vertebrates have only four arrestin subtypes, two of which are specifically expressed in photoreceptors in the retina, whereas the two non-visual arrestins are ubiquitously expressed and apparently regulate hundreds of different GPCRs. Later studies showed that, in addition to receptors, non-visual arrestins interact with dozens of other signaling proteins. Current view is that arrestins are versatile regulators organizing multi-protein signaling complexes and localizing them to particular subcellular compartments. 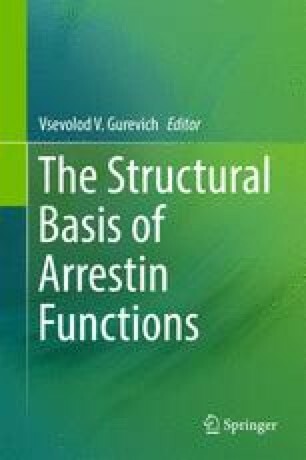 Arrestins can exist in several distinct conformations, the best-studied being basal and receptor-bound (often termed “active”), which differentially engage various partners. Identification of the arrestin elements engaged by each partner and construction of signaling-biased arrestins where individual functions are selectively disrupted or enhanced, helps us to elucidate their biological roles in the cell. Supported by NIH Grants EY011500, GM077561, GM109955 (VVG), NS065868, and DA030103 (EVG).